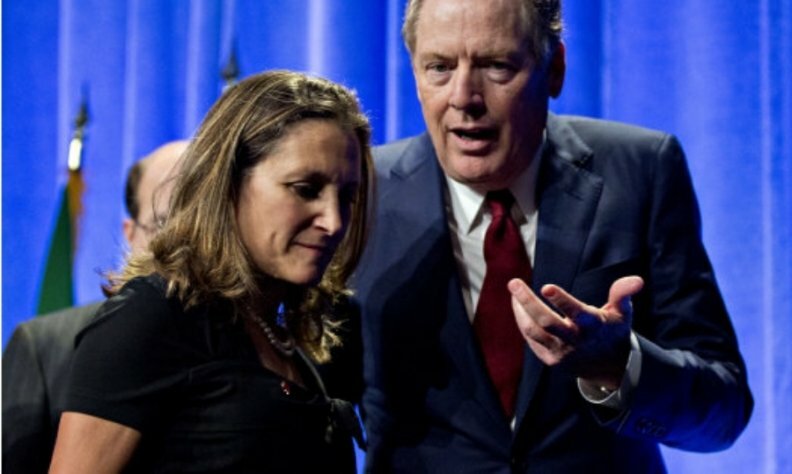 Foreign Affairs Minister Chrystia Freeland said Monday that she and U.S. Trade Representative Robert Lighthizer have agreed to meet again face-to-face to try to reach an understanding about each other's positions on NAFTA, although an exact meeting schedule hadn't been set. Freeland said trade officials from Canada and the U.S. have been meeting in the American capital since last Thursday, continuing what the minister described as "intensive" talks aimed at reaching a deal. "The specifics of our calendar we haven't quite yet worked out." "We certainly wouldn't have gone in and lectured on things like gender rights and the environment," Bergen said when asked how the Conservatives would have handled the negotiations. "What the prime minister had done in these trade negotiations is tick people off," she said. But when it comes to the NAFTA talks, Trudeau said during a live interview event with Maclean's Magazine in Ottawa Monday night he would not do anything differently. Trudeau was asked about two incidents that irked Trump — the first being comments he made during his press conference in Charlevoix, Que. after the G7 summit and secondly — Freeland's acceptance speech at an award ceremony in Washington where she denounced Trump's "absurd" tariffs and argued for the preservation of the world's rules-based order — with or without the United States. "As I've said from the very beginning, Canadians expect me, particularly with this administration, expect us as a government to do two very important things: One is have a constructive relationship with the American government and two, continue to stand up clearly and strongly for our values and our principles and Canadian interests." Doing both of these things sometimes "bump up" against each other, said Trudeau, adding that it is important to highlight to Americans who Canadians are and where they stand. While Canada has been pushing for chapters in NAFTA aimed at strengthening labour protections and gender equality, the overall negotiations are said to have stalled over Canada's insistence that an agreement contain an independent dispute-settlement mechanism. Trudeau has also vowed to protect Canada's supply management for dairy and poultry products against U.S. demands for greater access by its farmers to Canada's dairy market. Supply management has been a big issue in the provincial election campaign in Quebec, home to about half of Canada's dairy farms. Quebec Liberal Leader Philippe Couillard has warned there will be "serious political consequences" if there is any further dismantling of the protections for dairy farmers through NAFTAnegotiations. Ontario Premier Doug Ford and his economic development minister, Jim Wilson, are scheduled to travel to Washington on Wednesday for an update on the NAFTA talks, which the premier characterized as critical to his province's agriculture, automotive and steel industries. Ford's team is expected to meet with Canada's trade officials, as well as the Canadian ambassador to the United States, and the premier said in a statement that he planned to stress the need to protect Ontario workers. Freeland said she would welcome any efforts by the provinces to bolster Canada's position at the bargaining table. "I think that the involvement of premiers from provinces and territories across the country has been very positive."